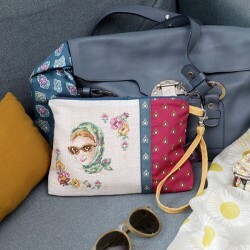 Vintage There are 131 products. 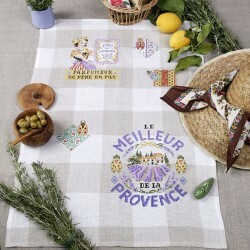 The little sunny squares of this material, framing a southern farmhouse, the scent of lavender and the sound of crickets, summon up all the charm of Provence for us. 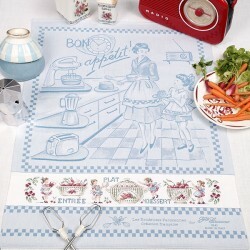 This tea-towel will be the olive on the cake in your kitchen, so to speak! 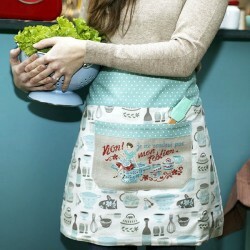 If your mother in law asks you to prepare partridge with prunes, your husband a plate of scallops with a Morney sauce or your daughter in law a dish of peaches in honey, you simply say “No, I won’t throw in the sponge!” But whatever happens, with this apron around your waist, you’re all set up! 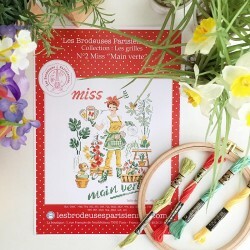 This 100% Brodeuses Parisiennes’creation, is a tea-towel with its deliciously Vintage material and cross-stitch embroidery, which plays on the tender complicity between mother and daughter! We just love the little girl busy with the pretty Digoin dishes and the refined powder-blue colour. 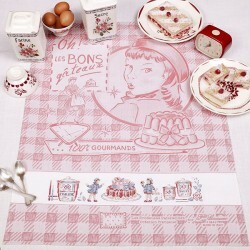 This 100% Brodeuses Parisiennes creation, is a tea towel which tips us a slightly wicked wink as far as the material is concerned and the embroidery has a great deal of charm. Its pretty rose colour is most attractive around the kitchen. 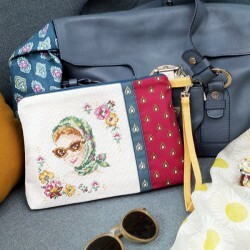 It’s simply delicious both to embroider and to look at!